Following on from completion of the original development in 2000, Hunter Douglas have recently completed installation of their Open Cell ceiling product as an integral element of the Phase 02 extension at the Excel London exhibition and conference centre. The new phase incorporates a boulevard extension where a mixture of the original white for continuity, leads into a two different shades of vibrant red. This gives the scheme differing colour perspectives which Architects Grimshaw required to differentiate the conference facility areas. 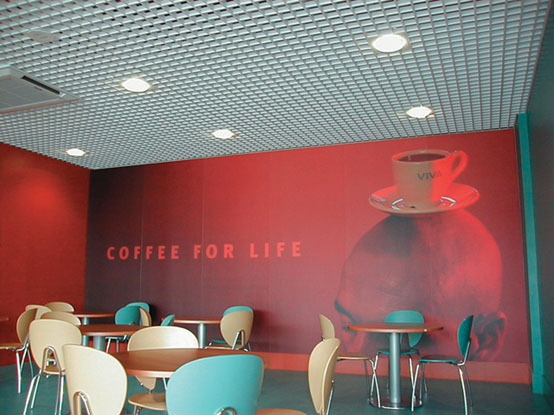 For the Excel scheme, high performance Open Cell panels were used externally in conjunction with an insect mesh to prevent birds getting into the void. Manufactured from lightweight and recyclable aluminium, Hunter Douglas Open Cell systems enable complete flexibility of design for angles and ceiling height changes while multiple finishes include a variety of colours and metallic options. 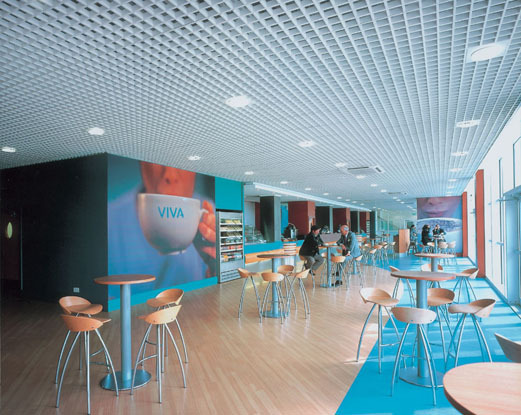 They create a clean, monolithic appearance and offer easy access to lighting, ventilation systems and sprinklers with a versatile range of cell sizes, configurations and colours which combine to offer the specifier a wide range of options. 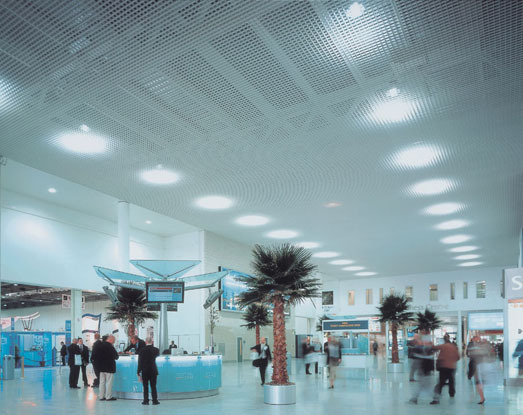 Using Open Cell ceiling systems it is easy to integrate light fittings, including track, fluorescent and recessed as well as fittings installed below, above, or within the ceiling plane. Hunter Douglas Open cell ceiling systems include key features including a patented sliding clip on panels which enables easy downward demounting of the panels to allow easy access into the void while maintaining a monolithic appearance. Cell configurations are available in a variety of different module sizes and shapes including square, rectangular or patterned, together with a variety of standard colors. Ben Heath, Associate at Grimshaw, commented: "On the Excel London Phase 02 project the use of the Hunter Douglas open cell ceilings provided not only cost and program benefits, but a striking finish which worked with the dramatic interiors we were trying to create".